From what we know, Jesus didn’t jog. He probably never did a sit up, never mind a reverse crunch. And personally, I just can’t see him sweating it out in a Zumba class. Jesus was a loafer. You never heard of Joseph and Son Carpentry and for good reason: the son left the family business. He was good with his hands alright but lumber just wasn’t his passion. He went out walking and when he found some men working — fishermen or tax collectors, for example, he would say, “Drop everything; let’s go.” So, one by one, they followed, leaving their toil and cares (and wives) behind. Where were they going? Oh, just a little ministry, check out the villages… the women bring them bread and wine, roasted goat and olives. The oil lamps illuminate his face as he speaks. The one and the twelve sat close with the lowlife, prostitutes and cripples. The commandment was to love one another and it was not a commandment at all but a pluck of the string. Rather, an invitation. Care for a seat? Jesus didn’t even bother to write! Or how about one of those twelve disciples write it out for him. He walked, he talked, somebody remembered. Jesus, my friends, was a very cool individual. 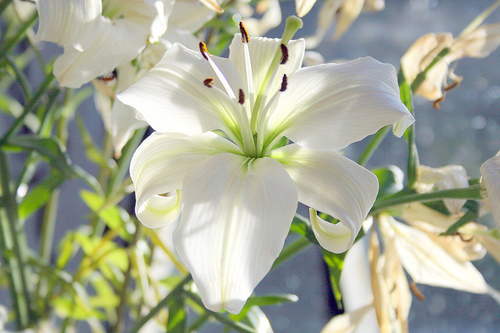 Consider the lilies of which Jesus speaks. Look at them. They are perfectly beautiful and they are naked.